Dinner tonight was so fun to make. I love making different pasta sauces, and I adored this one. I decided at the last minute to add some sweet peppers to the mix; I love this addition to a marinara. 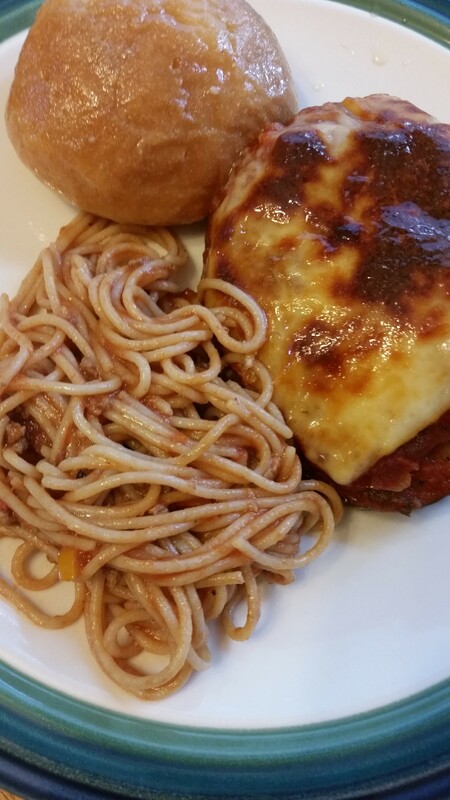 It gives it an extra chunky and sweet component that added something different from the normal marinara. I am the only one who likes eggplant in this family, but that never stops me from making what I want! When I saw a beautiful eggplant at the store, I just had to get it. 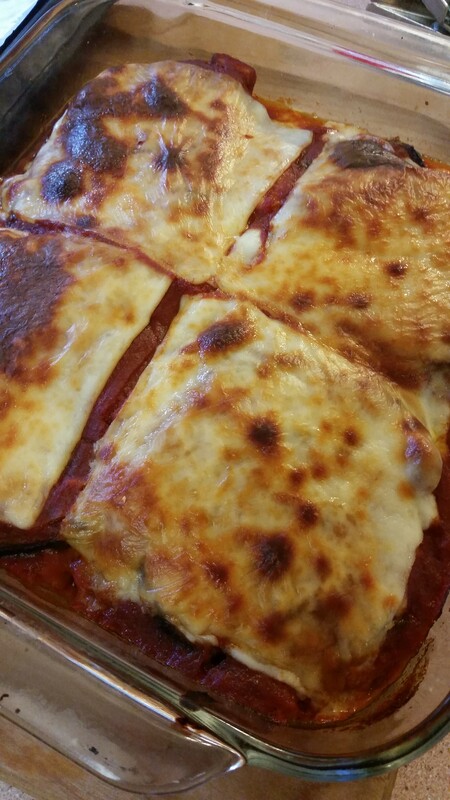 I made a small pan of eggplant parmesan lasagna- no noodles. 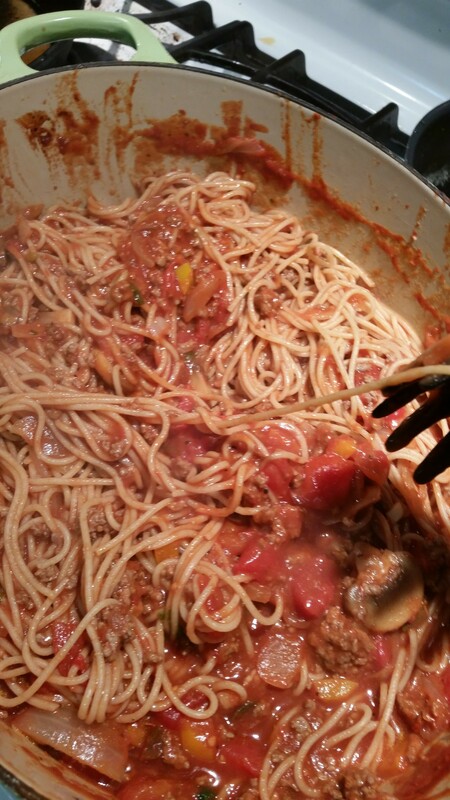 I used the eggplant disks as the pasta; this recipe can serve 4. I had one, saved one for lunch tomorrow, and gave the rest to my awesome neighbor along with a bunch of leftover pasta. Oh, and those garlic butter rolls? So good!!! Any fresh herbs, chopped- I added basil, sage, thyme, oregano, marjoram, and parsley. Use dried herbs if you don’t have fresh. I would even combine them if you need to. Take your ground beef. Add in a screaming hot pan. Cook until meat is browned. I used a cast iron skillet. Once done, drain any excess fat/grease. Place to the side. In a large dutch oven, cook your onion in a bit of oil/butter combo (about 1 tablespoon each). Add the rest of the veggies. Add your tomato paste and stir. Add the wine and worcestershire. Cook down for about 10 minutes. Add the canned tomato ingredients, sugar, and fresh (or dried) herbs. After it cooks for about 25 minutes, separate half in another pan (this is to have one without meat for your veggie eggplant parmesan). Add your ground meat in one of the sauce pans. Cook all together for AT LEAST 30-45 minutes— The longer you cook it, the better. Add to your favorite pasta. 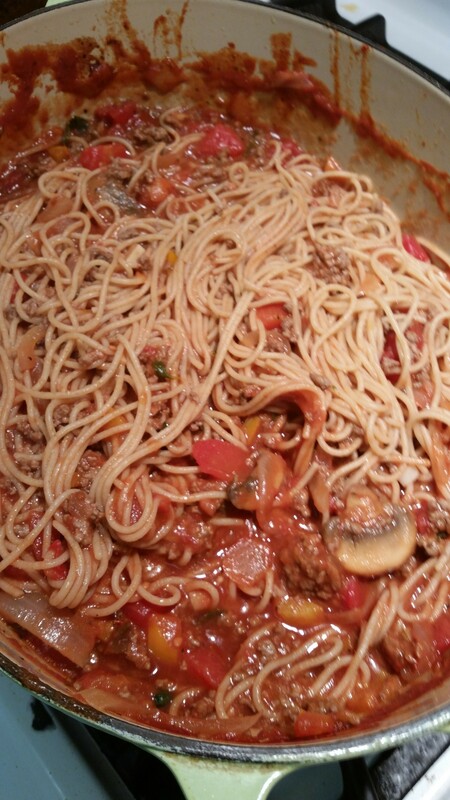 I used whole wheat spaghetti. There are some really great whole wheat pastas out there now. Give them a try! 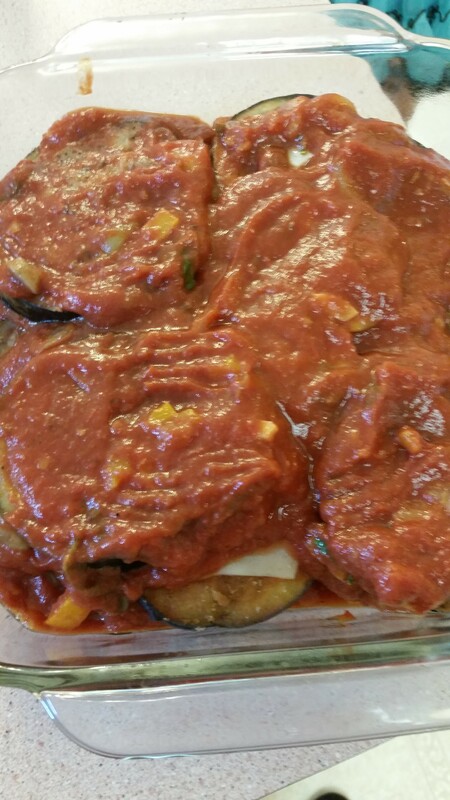 Cut your eggplant in medium slices. Salt and pepper both sides well and let sit for 15 minutes or more. This draws out the water a bit in the eggplant. 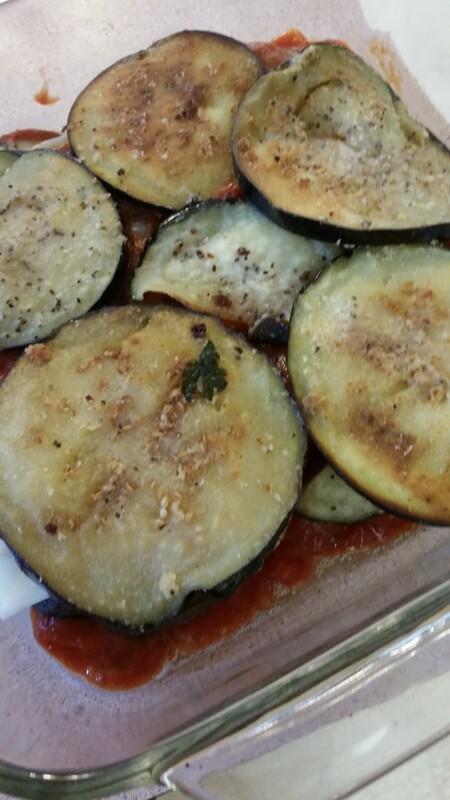 Add a bit of oil or cooking spray on each side of the eggplant. 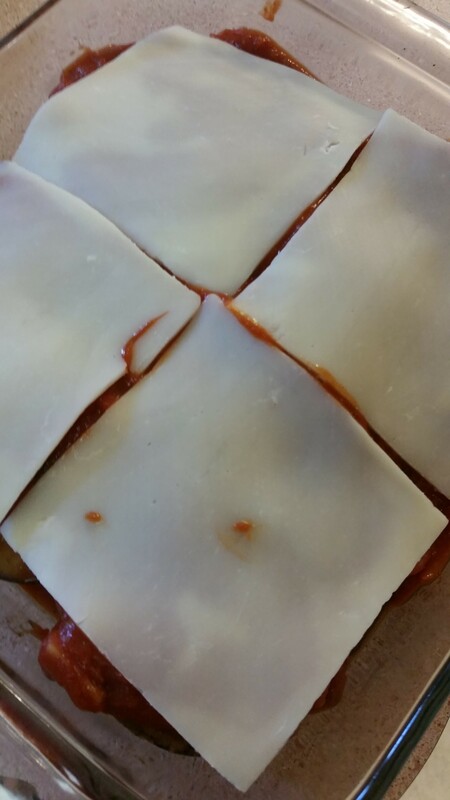 Dip each side in flour. I did not go with the traditional dip with eggs and breadcrumbs; trying to make it semi healthy. Brown each side in a bit of canola oil. Put a bit of your marinara sauce on the bottom of a small corningware dish. 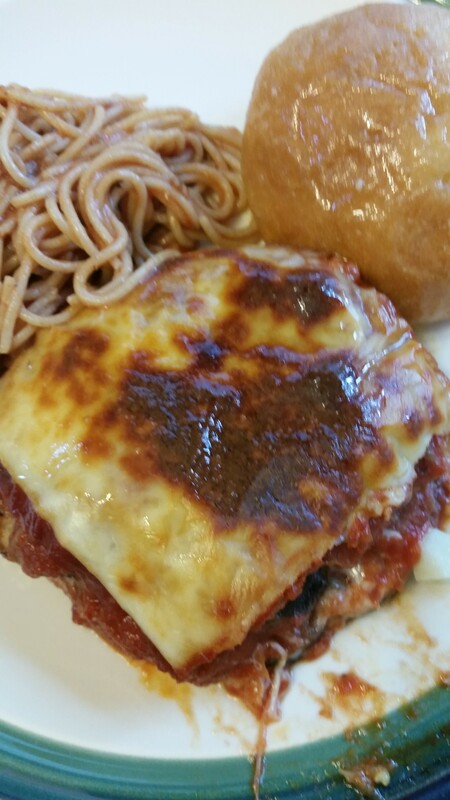 Layer the eggplant (like noodles in lasagna), marinara, and mozzarella cheese. Bake at 300 for 30 minute. I turned it on broil the last 5 minutes or so to get my cheese to brown. SO GOOD!!! Melt a stick of butter with 4 cloves of crushed and chopped garlic. Take ordinary yeast rolls (or whatever bread you have). Poke some holes in them with a fork. Brush the rolls with the garlic butter. Cook for about 5 minutes. Then baste them in the garlic butter again. Put back in on broil with your eggplant. Take out and baste again. Heaven!